We are a voluntary group that relentlessly promotes research, conservation and celebration of the Springs, Spouts, Fountains and Holy Wells of the Malvern Hills and of Great Malvern as one of many Malverns world wide. Friends are totally independent, a status that we value and which keeps us unencumbered by diversions not conducive to our pursuits. We are pleased to work with all who have a positive interest in our activities. Friends are kept informed with our Newsletter and can participate in the various activities and projects. When emailed, newsletters are free. There is no membership fee or onerous rules to comply with when you are a Friend. CLICK HERE to become a Friend by emailing us. Springs and Wells - It was in 1992 that serious research was started to catalogue and promote the springs and wells heritage of the Malvern Hills. There are now about 130 recorded, celebrated Springs, Spouts, Fountains and Holy Wells sites. Many of the famous sources are still running albeit some have been lost, while others have been restored as a result of local effort. Visitors, travelling upward of 100 miles, and locals alike collect the refreshing spring water and opinions vary as to which is supposedly the most likeable. Even if not "taking the waters" many enjoy the opportunity of exploring the Malvern Hills and discovering the whereabouts and history of the many springs and wells. In May 2017, international envoys Cora Weaver and Bruce Osborne receive on behalf of Great Malvern UK a state flag of Pennsylvania that had flown over the State Capital in Harrisburg on the 26 April 2017 on behalf of Duane Milne, PA House of Representatives. 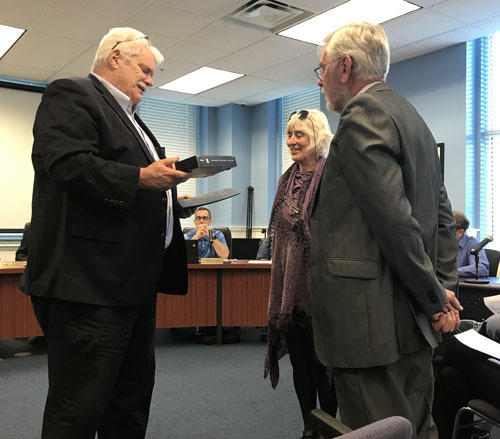 The presentation took place at the Borough Council Meeting of Malvern Pennsylvania. Malverns Worldwide - In 2016, following interaction with a number of Malverns throughout the world, it was decided to formalise this activity under a common banner "Malverns Worldwide". As a result since 2016, contact has been forged between many of the two dozen Malverns. This has included visiting the various locations and the exchange of gifts between the civic leaders in Great Malvern and those elsewhere. This is leading to a number of projects developed from common interest themes. 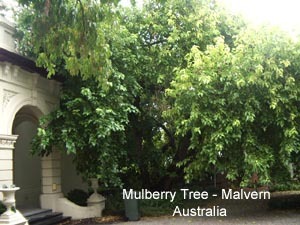 One such project is the provision of George Bernard Shaw mulberry trees to Malverns across the globe. For more information click the logo link below. Launched in 2012, this book is your invitation to explore the springs and wells of the Malvern Hills, both in the field or at home in the armchair. Have you ever wondered where Great Malvern's Dumpling Fountain was? And did it look anything like a dumpling? Would you like to know, at last, where Dr Gully's elusive Neubie House really was? And which of today's well-used fountains was the brainchild of Barry Jackson? 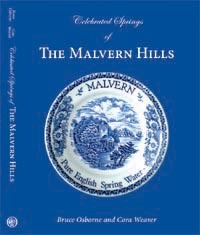 The answers to these questions, and a host of new information about the history of Malvern and its waters, can be found in Celebrated Springs of the Malvern Hills, by Cora Weaver and Bruce Osborne. This work is the culmination of 20 years' research by the authors, who published their first book on the springs and wells of the Malvern Hills in 1992. That little book contained details of 27 springs and wells. This new work details 130 celebrated sites, and contains information and pictures that have never before been published. Using this book discover the springs and wells of the Malvern Hills on foot, by car or bicycle - and historically. Maps and grid references guide you to elegant fountains, commemorative water features, animal troughs, water tanks, gushing flows and useful spouts where, even today, many people collect the water for domestic use. The text explains and interprets what you see. You can discover who provided water for the town before water mains were invented; where the water came from; who maintained the springs and fountains; who used them, and the problems of contamination. The theme of well-decorating since 1993 runs throughout the book, and is illustrated with many colour photographs of decorated wells, and there is a whole chapter on bottling Malvern waters. Published by Phillimore in hard back, the book is lavishly illustrated with almost 200 pictures and a similar number of pages. This book would not have been possible without the support of many individuals and organisations, particularly Coca-Cola,who have ensured that Celebrated Springs of the Malvern Hills is a tribute to 160 years of bottling Schweppes Malvern Waters and that Malvern's water heritage will live on. The book's regular retail price is fifteen pounds available from Cora's Great Malvern Bookshop by clicking on the green menu top left. For more details of this book click the cover above. Newsletter Archive On-line - Take a nostalg ic trip into the past by browsing our archive of Friends Newsletters. They are also a valuable research tool. The latest ones give a clearer idea of the activities of the Friends. An index of contents in included on the INDEX PAGE. To go to the index click the newsletter icon right. Plans for a new visitor centre 'Gateway to the Hills' took a giant leap forward during Civic Week. On Friday 8th June 2012 a reception and presentation was held to launch the Gateway project. The event began with a conducted walk through Great Malvern, led by Cora Weaver of Friends of Malvern Springs and Wells, who outlined the impressive heritage and visitor attractions of the town. 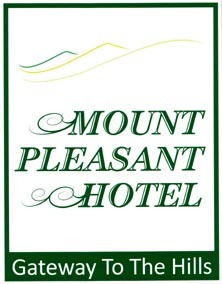 Ending at the Mount Pleasant Hotel for afternoon tea and cakes, Bruce Osborne of Friends of Malvern Springs and Wells then presented the case for the new visitor centre Gateway to the Hills, to be created by transforming the Mount Pleasant Hotel and grounds in Great Malvern. He said that although not formally named a National Park, the Malvern Hills are arguably Great Britain's original National Park. Established as a protected landscape by Act of Parliament in 1884, the Malvern Hills Conservators own and manage the landscape on behalf of the nation, thus conforming to the international definition of a National Park. There are now 15 formal British National Parks, all established since the Second World War and the Malvern Hills makes an unnamed 16th. One big difference however between the Malvern Hills and the formal National Parks is that the Malvern Hills lacks a formal Visitor Centre, often the first stopping off place for tourists. A further issue with Malvern is the link between the town and the hills. Many town visitors can see the hills but do not know how to reach them. This is now being addressed by the 'Route to the Hills' scheme initiated by Malvern Hills District Council. The Mount Pleasant is ideally located as the link between the landscape of the Hills and the townscape and this is addressed through the aptly named Gateway project. "We believe this is a much better proposition than trying to re-establish a tea hut on the summit of the hills or a series of ad hoc services scattered over a wide area," said Dr Bruce Osborne of the Friends of Malvern Springs and Wells, "The Gateway will be the visitor centre for what is really Britain's original National Park". This scheme encourages the enhancement of Malvern's water heritage. The Award is a public recognition of outstanding endeavour in the conservation or renovation of our springs and wells and their immediate environment. 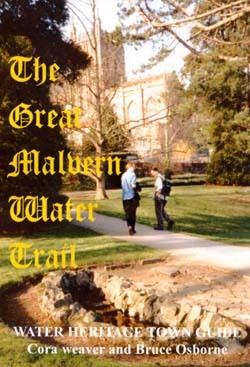 The scheme is run by the Friends of Malvern Springs and Wells in conjunction with Malvern The Original English Water and is unique in that Friends nominate candidate sites. All Friends are then invited in the newsletter to use a quantified marking system to determine whether the site adequately fits the criteria and should receive the award. It is Friends who decide. Sites awarded receive the St Werstan hand cast brass trophy. For much more information about St Werstan, patron saint of Malvern Springs and Wells and the background to this scheme click on the heading above. In 1936 George Bernard Shaw planted a Mulberry Tree near the Mulberry Spring in Priory Park, Great Malvern as part of the Malvern Festival celebrations. The octogenarian playwright had been fundamental to the establishment of the festival and the planting was a celebration of this. Shaw died in 1950 aged 94 years and the tree was blown over in a storm during the winter of the year 2000. The memorial to Shaw was thus lost forever, or so it was assumed. Research by Friends of Malvern Springs and Wells however revealed that in 1959 a cutting from the tree had been successfully sent and established in Malvern Australia. Further investigation identified where the now massive tree continued to thrive and so a project was launched to return a cutting to Great Malvern, England. With the sponsorship of Coca-Cola, former bottlers of Malvern Original English Water from the Malvern Hills, England and the City of Stonnington, Australia where the tree thrives, plans were prepared. The outcome was that saplings arrived and were collected from Heathrow Airport 14th August 2009 for dispersal to secret locations for rearing into plantable trees. The best of these was planted in Priory Park, Great Malvern and unveiled by Di Foster from Malvern, Victoria, Australia on the 25 June 2016. Click the Two Malverns heading above for the full story and updated information. Browse Our Newsletter Archive which can also be accessed from our WEB SITE INDEX. Friendship - There is no charge made for joining Friends of Malvern Springs and Wells. Just let us have your email address and we will send our newsletters, which are usually two monthly. Do feel free to participate in our activities by contacting us below.